Building a house is a mysterious process for most people, and hurricane-resistant building is even more daunting. Even professional builders can be confused by the many building codes, insurance requirements, engineering calculations, and best practices that apply to residential construction on the Gulf Coast. 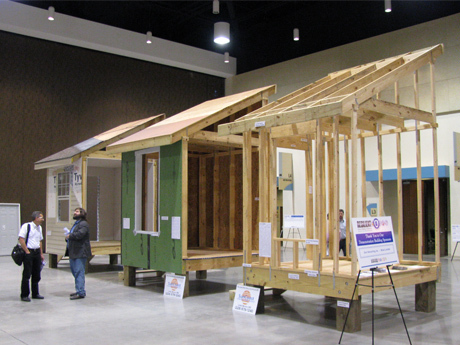 With that in mind, the GCCDS recently embarked on a project to build three full-scale construction demonstration pods for the Mississippi Home & Garden Show on March 19-21. The pods were part of a Resiliency Expo organized by the Community & Regional Resilience Institute, a research initiative supported by the Department of Homeland Security, Oak Ridge National Laboratory, and other federal, regional, state, and local partners. The three pods demonstrate different stages of construction. 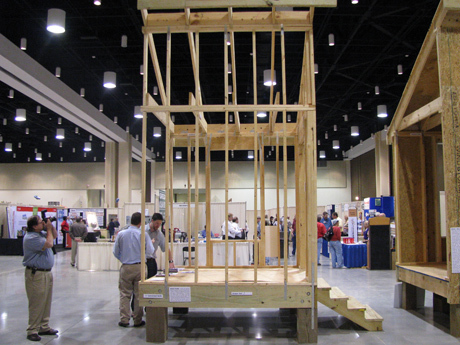 The first shows the framed walls, ceiling, and roof, and the hurricane straps and ties that are commonly required on the Gulf Coast. The second shows the sheathed building, including typical windstorm sheathing and ZIP System sheathing, and also demonstrates 2×6 ‘advanced framing’ techniques. The third shows some of the common interior and exterior finishes, including drywall, architectural shingles, and HardiePlank siding. 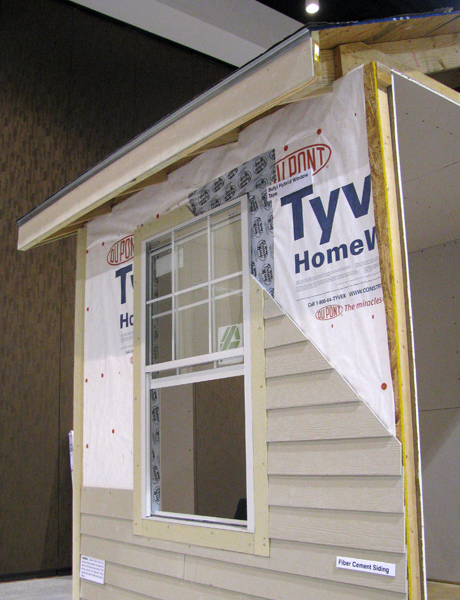 The exhibit proved to be a popular part of the Home & Garden Show and was an effective teaching tool for David, Mike and James’s lectures on building construction. Particularly for the general public, talking about joists and rafters, straps and ties, and blocking and nailing patterns can get very confusing. It’s very helpful to see a life-size example, cut open to reveal all of the elements that make up a building. Pods like these could be useful for construction classes, resiliency education, and other efforts. The biggest challenge of this project was the size of the pods. At 8′ square and nearly 16′ tall from floor to ridge, they were an awkward size even for a forklift. Although the framed pod was light enough to be moved in one piece, the second two had to be transported in two pieces, then assembled on site, which made the construction schedule difficult. And once they were completed (with sheathing, siding, and so forth), they became too heavy for a forklift to manage without tipping over. Unfortunately, this meant that these two pods had to be demolished at the end of the exhibit; due to time constraints, we didn’t have a better solution than to simply tip them over and use a truck to drag them out to the dumpster. All in all, however, the pods were a success. Having a full-scale, physical mockup is an excellent teaching tool that illustrates many of the conditions found in a real house. The lesson we learned is to carefully plan the size of the pods so that they can be easily transported and displayed. With the right planning, the pods could show a multitude of different materials and building techniques, including elements that we didn’t show such as wiring, insulation, flooring, light fixtures, plumbing, and more.